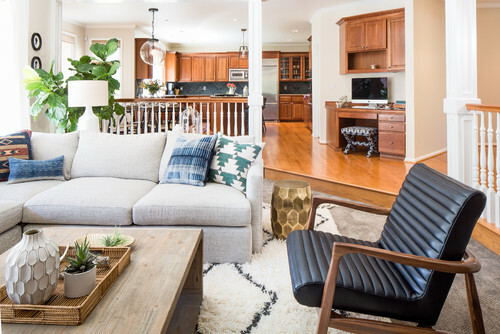 This article originally appeared on Houzz.com. You won’t find a big-screen TV in this living room across the street from Lake Sammamish, near Seattle. That’s because after a day of boating or hiking on nearby trails, the homeowners, who live here year-round, long to stay unplugged reading, playing games, entertaining and snuggling up as a family. To help strike the active-outdoor-meets-lazy-indoor vibe, designer Katie Cooper Scorse introduced natural elements, layered textures, mixed wood finishes and colors commonly found in the traditional Native American folk art of the Pacific Northwest. A large upholstered sectional sofa offers an inviting place for family members to hunker down and enjoy a roaring fire after a day on the lake. Scorse kept the existing fireplace and mantel as-is since the homeowners loved the natural stone veneer, maple mantel and built-in bookcases. She styled the mantel with glass lanterns and a large round mirror to create visual balance with the large fireplace. Scorse saw the coffee table as an opportunity to bring in a modern element with an earthy natural wood finish; the rounded corners make sense amid all the kid traffic. A simple rattan tray, several vases and potted succulents further push the natural theme and aren’t too precious for exploring hands. A Moroccan shag rug layers over wall-to-wall carpeting for more kid-friendliness underfoot. “It’s super comfy and perfect for little toes running around the room,” Cooper says. Custom pillows are covered in African mud cloth, indigo batik and vintage Hmong tribal patterns that recall Pacific Northwest evergreens. 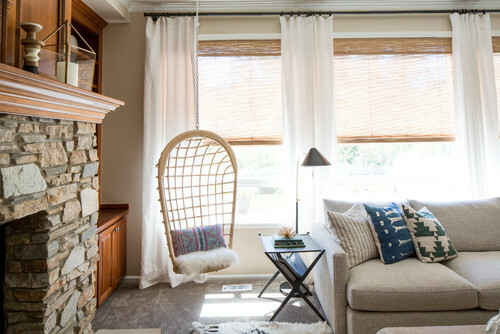 You can bet that minor squabbles break out over who gets to sit in the hanging rattan chair, which features a faux sheepskin seat and a pillow covered in traditional Hmong batik. Ivory linen drapery panels frame large windows that bring in fresh air and views of lush woods. 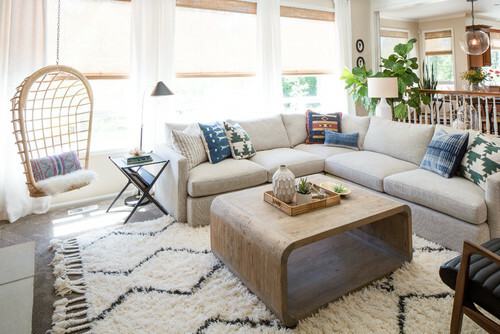 Custom woven wood shades help filter the bright afternoon sunlight and keep the room cool. But everyone in the house knows who has first dibs on the midcentury armchair. “The man of the house wanted ‘his chair,’ and this was the perfect piece to pair with the large upholstered sectional,” Cooper says.